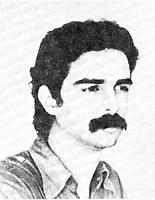 Born in 1948 in Camagüey. He studied at the drawing school in Havana. He is the master of poster and humorous drawing. Agramonte leads the humorous column called “He and She” in the Bohemia magazine. His drawings were exhibited at his first solo exhibition. His second exhibition was called “I’d like to work”. Agramonte constantly collaborates with Cuban television, his works are published in the El Satiro ilustrado Venezuelan satirical magazine. He is a participant in international cartoon contests.